Morales actually ejected Schwarber, which is funny because at that point the game was over. 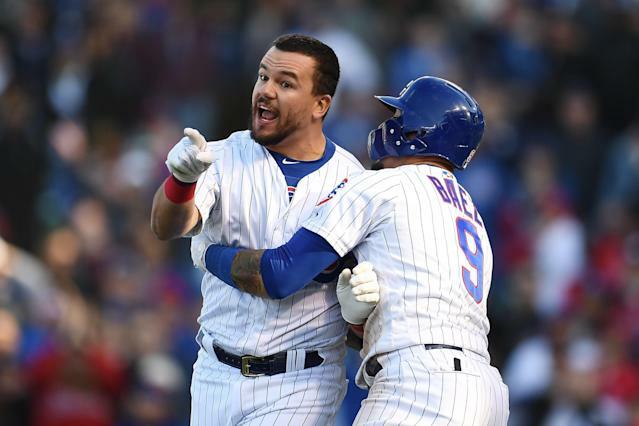 While we don’t endorse reactions like this, it does look like Schwarber had a legit argument. No swing would have meant a walk. A walk would have meant a run. A run would have tied the game and given Chicago a golden opportunity to win. Instead, they lost the game 6-5 and fell to 5-9 on the young season. It also adds to Schwarber’s frustration at the plate. He’s only batting .192 so far in 2019. It was a similar scene in San Francisco. Rockies star Nolan Arenado was livid after home plate umpire D.J. Reyburn called him out on a pitch that was clearly off the plate. Despite getting in Reyburn’s face, slamming his bat and slamming his helmet, all of which could be grounds for an ejection, Arenado was allowed to remain in the game. Perhaps that’s because Reyburn immediately realized he missed the call. Regardless, it didn’t do much to quell Colorado’s frustration. The Rockies went on to lose the game 5-2, and are now 3-12 on the season. Clearly, both teams have problems that go well beyond the umpires. In the Rockies case, it’s an offense that’s only averaged 2.8 runs per games. For the Cubs, it’s a pitching staff and defense that both rank bottom six in MLB. But with the pressure mounting as their division foes rack up wins, it’s not surprising to see these emotions coming out.